The Mission of the Auburn University Summer Band Camps is to provide students with an opportunity to enjoy learning from prominent instrumental music educators, making music with musicians from around the nation, and working with the outstanding summer camp faculty. Our desire is to see students grow as musicians, leaders, and individuals to further enrich their lives. More details about AU Summer Band Camps coming soon! The Auburn University Bands proudly sponsors three separate Summer Marching Band Camps for high school students. Drum majors and section leaders will benefit from our Marching Leadership program, which emphasizes leadership training and conducting, as well as marching and music pedagogy. Colorguard, dancers, and majorettes will enjoy our Marching Auxiliary program, which includes basic and advanced technique development and group routines. This year, a separate track will be added for auxiliary captains, addressing teaching skills and choreography development. Lastly, high school percussionist can take advantage of our Marching Percussion program, which includes master classes, section rehearsals, and large ensemble rehearsals. All Summer Marching Camp participants will take part in a combined Finale Concert at the end of the weekend, open to parents and the Auburn community. Participants will also have fun hanging out with their new friends during breaks, lodging in AU Residence Halls, and taking part in organized games and social activities during the evening hours. 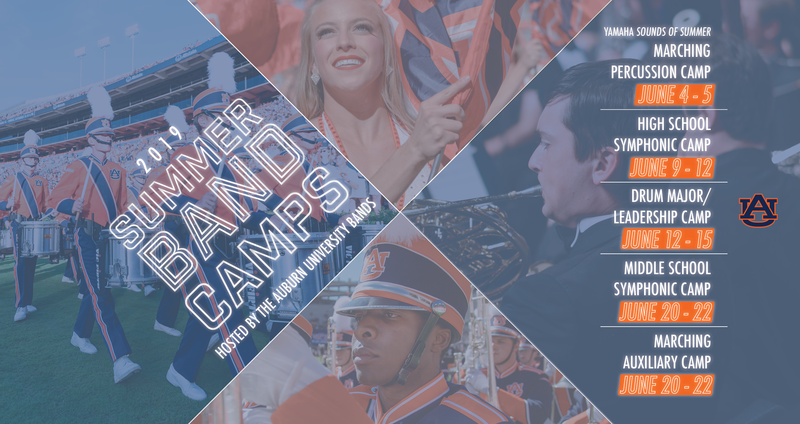 Auburn University Summer Marching Band Camps are an experience you don’t want to miss! The Auburn University Bands holds two annual Summer Symphonic Band Camps each year. These camps, designed for Middle School and High School students respectively, provide an excellent opportunity for the musical development of our participants during the summer. Rehearsals with band students from across the country, as well as section rehearsals and master classes, are a reason your child won’t want to miss out on being a part of our summer camp program this year. Throughout the camp participants will get to know their fellow campers while staying in AU Residence Halls and taking part in games and social activities, which make this a fun camp experience any band student would enjoy. At the end of the camp the participants will perform in a Finale Concert for parents and the Auburn community. 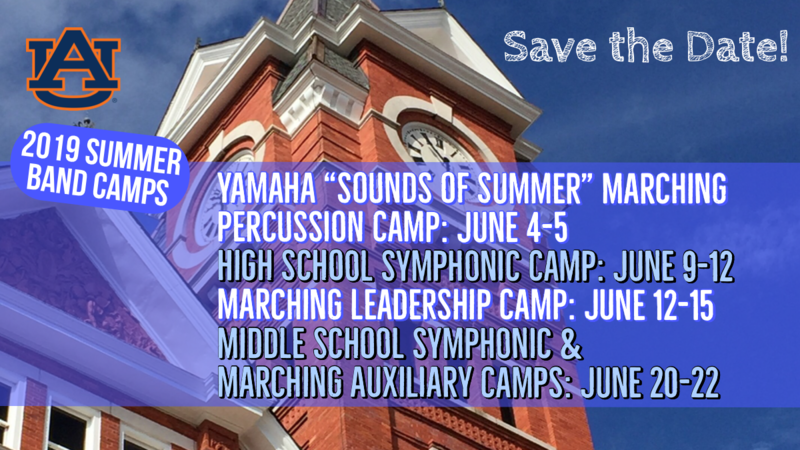 We hope you come on down and take advantage of the one-of-a-kind experience you will have at Auburn University Summer Symphonic Band Camps. Student Essay (1 page) stating reasons for the desire to attend camp, reasons for applying for the scholarship (financial need), and how receiving this scholarship could benefit their music education in the future. Letter of Recommendation from current Band Director.